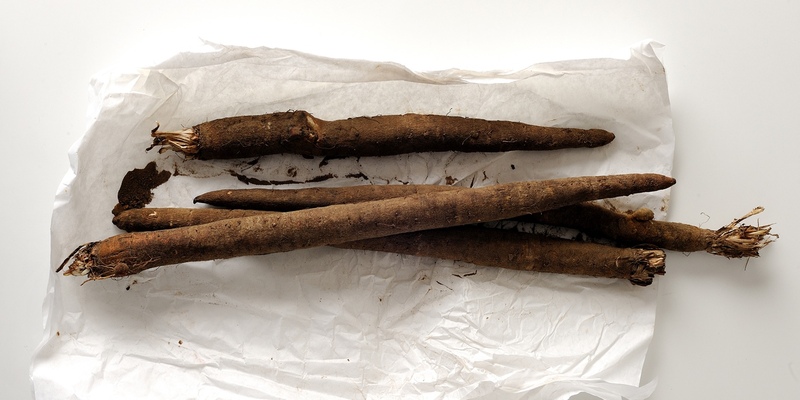 Salsify - also known as oyster plant - is a root vegetable with a similar flavour to oysters. With a rough, brown skin, and pale, soft inner, it is a favourite with chefs looking to add different textures to a dish. Enjoy it from October through to January. Browse our salsify recipe collection for inspiration on how to use this criminally underused vegetable, including Richard Corrigan's turbot with mussels, sea vegetables and salsify, Martin Wishart's roast pheasant hens with Puy lentils and salsify, and Simon Hulstone's smoked salmon and lemon infused salsify.